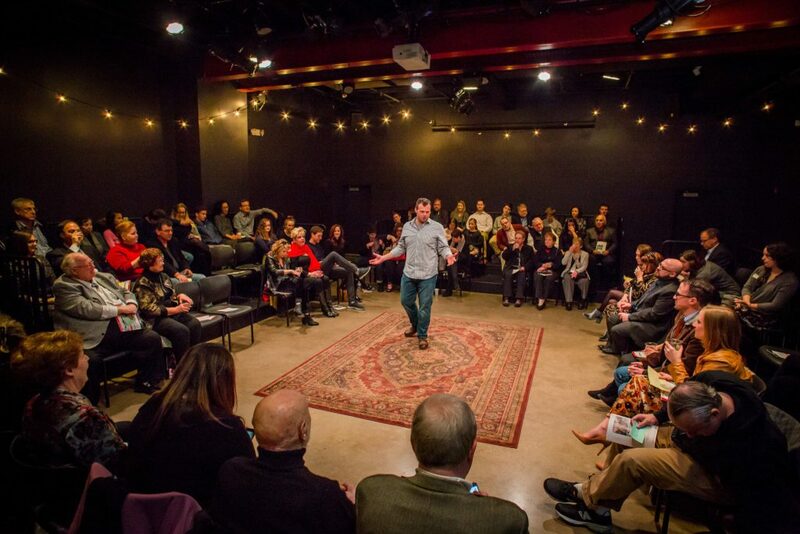 Rep’s ‘Every Brilliant Thing’ engages and amuses audience on some dark subjects. 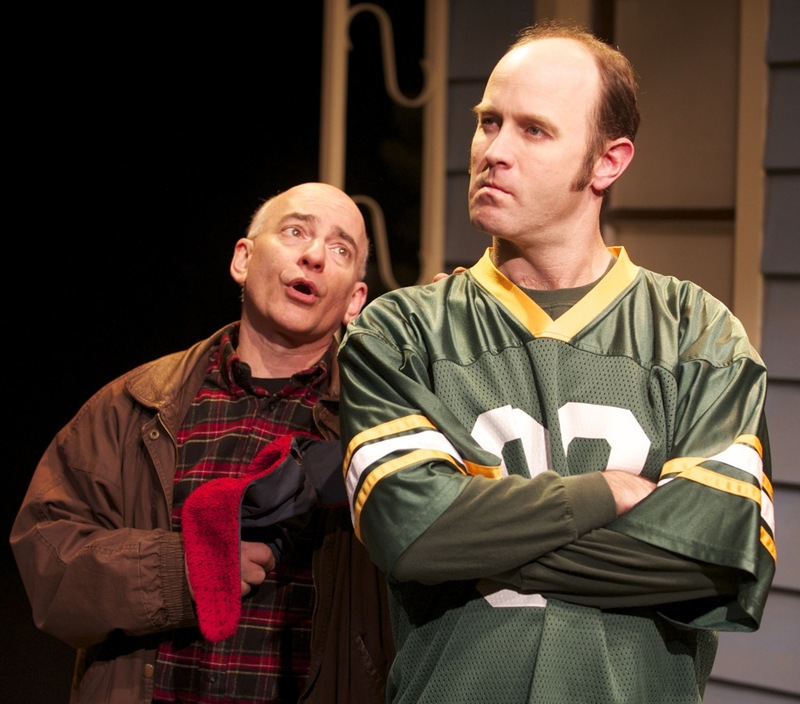 Milwaukee Repertory Theater’s Every Brilliant Thing. Photo by Ashley Smith, Wide Eyed Studios. The Milwaukee Rep’s versatile and utilitarian Stiemke Studio has proven a fertile playground for the technical staff in cutting-edge productions for large casts, but also for one-person storytelling, some involving complex staging, others not. Add Every Brilliant Thing through May 5 to the category of simple staging and outstanding one-person storytelling. The set is a large Persian rug that four ushers make sure the audience doesn’t walk on as they enter the theater. In front of them, nothing but the rug and occasionally chairs and books used as props by the actor and organizer, Scott Greer, who roams the stage and even sometimes the audience seats. Previously known to Rep audiences as Lennie in Of Mice and Men, Greer this time is employing his masterful techniques from comedy improv, wheedling and pre-setting dozens in the audience to help him out at key moments. Greer uses the audience as touchstones in developing the list that carries the narrator from childhood through adult marriage as a salve to the depression and suicide attempts around him in life. It is more than a bucket list and perhaps less than Schindler’s List, but it is “a list of life,” as Schindler’s was, this one recording the trivial moments that make every day a wonder to live if only the emotionally troubled could read it. The audience becomes engaged in this list, eager to laugh along with Greer at those recognizable little moments that add pleasure to every day. The volunteers from the crowd either read moments in the list or help Greer create an amusing gallery of people who influenced his life and attitude. As in Comedy Sportz, the willing in the audience become part of the fun. On opening night the structure was so seamless that you had to wonder if every audience member asked to participate will be this good at every performance. But then you realize the potential warts have been anticipated. Greer is attuned to his material, quick with the ad lib and so reactive to the audience that there is deep preparation for any mishaps. He has an invisible helper for spot-on sound and music cues (I suspect stage manager Audra Kuchling) to carry the production over any slow spots. The play is by Duncan Macmillan and actor Jonny Donahue, who originally performed “Every Brilliant Thing” to great notices. This production feels like a regional theater demonstration that it has a strong enough construction and dialogue to stand up anywhere in the country. Generally it does, though the story meanders a bit at the end. And it sure reminds you how the choice of the right actor remains king. Emphasizing how it adds understanding to suicide is a bit tricky for the Rep in advertisements and for any reviewer. We shun any discussion of death and depression as, well, depressing. Every Brilliant Thing demonstrates and celebrates the engaged life and laughter that serve as valuable counterweight to our wariness. That’s the real message the Rep hopes audiences take home.